Loma Linda products are now known as Loma Blue - same great taste and quality, but now with improved ingredients! 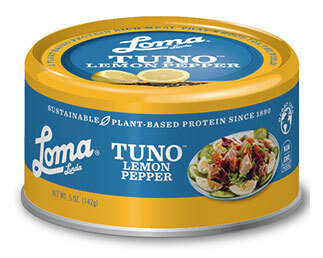 Tuno is back and better than ever with this tasty and flavorful Lemon Pepper version of the classic vegan tuna alternative. All-natural and made from textured soy protein, this awesome tuna alternative is naturally low in calories, carbohydrates and fat, making it a healthy way to enjoy your favorite flavors and textures in a way that's both cruelty-free and good for you, too. Mix it as you would any tuna salad recipe and enjoy the deliciousness of Loma Blue Tuno! BPA-free. 5 oz. (142g) cans are $1.99 each.